PROMOTER Ritchie Gee reaffirmed his status as Britain's number one rock'n'roller by being chosen to drive Elvis Presley's songwriters to a film premiere. 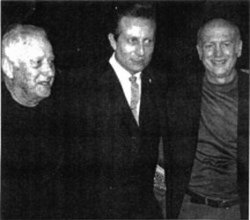 Jerry Leiber (left) and Mike Stoller (right) with Ritchie. for Elvis feature films Love Me Tender and Jailhouse Rock. The pair also penned Searchin', Yakety Yak and Charlie Brown for the Coasters in the 1950s and later wrote hits for the Drifters including Save the Last Dance For Me, On Broadway and Up On the Roof. Ritchie drove the pair to the film theatre in his gleaming white and blue 19ft-long Lincoln Continental - the only one of its kind m the country and was greeted by hordes of rock 'n' roll fans and the paparazzi. "There was all these cameras going off and I have never experienced anything like it," Ritchie said. "People must have thought I was them when I went to open the door. "Mike Stoller even asked me where I got the car from because you don't even get them in the States." The Lincoln is a rare edition, designed by international yacht designer Bill Blass in 1979, and only 3,900 were ever manufactured. Ritchie became an idol to Elvis fans last year when, on a similar jaunt with Sam Phillips, the man who discover-ed Elvis, he narrowly avoided a collision ith a double decker bus. 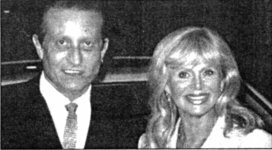 At the star-studded theatre premiere, Ritchie had in encounter with actress Britt Ekland. "Britt came up to me and said 'that's a nice quiff you've got' and then said I had a really sharp suit on," he beamed. Ritchie was proudly airing his �500 tailored whistle, which he describes as his 'Raindrop' design. With the likes of Britt Ekland, Helen Mirren and Susan George adding a touch of glamour to proceedings, Ritchie believes that the rock'n'roll movement is on the verge of a major resurgence. "I really do think it's becoming fashionable again," he said. His view is reinforced by the line-up for a recent Lieber and Stoller tribute gig at the Hammersmith Apollo featuring Meatloaf, Bob Geldof, Leo Sayer, Jimmy Tarbuck and Brian Conley. And TV's Never Mind the Buzzcocks' host Mark Lamarr, dubbed the 50s throwback, has also been known to attend the Tennessee Rock'n'Roll Club.